The kids are jumping around, everybody's doing loop de loop. 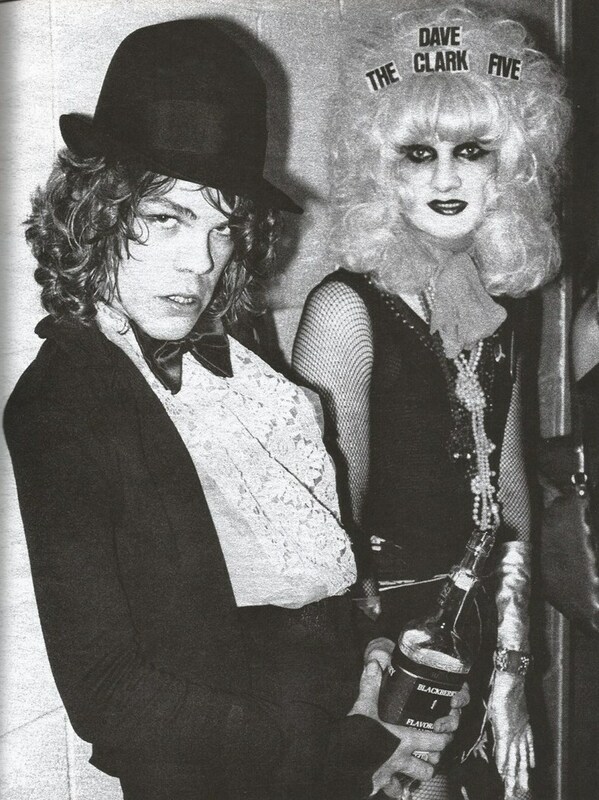 Upstairs the New York Dolls are kickin' it out - looking tough. Down at Max's (Max's Kansas City). All the boys are (Max's Kansas City), all the girls are (Max's Kansas City), all the stars are (Max's Kansas City), down at Max's. I see Patti Smith she's the Stagger Lee of rock and roll. She threw a seven and eleven and she always knows which hearts to hold. And I see Lou Reed and er Iggy Pop they're just a getting higher and higher. Give those boys one more drink and they're gonna set the place on fire. Bad girls - just a lookin' for a kiss. Blondie's all in a buzz she's on the cover of the New York Rocker. Dee Dee Ramone strips his bass to the bone, he's a blitzkrieg bopper. The Heartbreakers are gonna give you a taste of going steady with Pirate Love. And you better watch it because my Backstreet Boys are gonna rip you apart. Trash, pick it up, you know where, that's right. Now I ain't talking about San Francisco. And I ain't talking about Los Angeles. And I ain't talking about Detroit City. I'm talking about New York City. Er, where are you going tonight? Well I think I'm gonna go down to Max's and er check out a couple of rock and roll bands. Oh yeah, who's playing there these days? Well there's er The Heartbreakers, Cherry Vanilla And Her Staten Island Band, Wayne County and the Backstreet Boys, The Fast, Pere Ubu, John Collins, Harry Toledo, Suicide, The Ramones, Blondie, The Dolls, Television, Talking Heads, August, ???? ?, Mong ,The Poppees, The Marbles, The Planets, The Miamis, Just Water, Tuff Darts, Day Old Bread, Richard Hell, Lance Loud and the Mumps, Another Pretty Face and Mink DeVille and phew. And oh yeah, oh yeah they got this new group that everybody's talking about called the Psychotic Frogs. Wait just minute there's just one more thing I forgot to tell you. You better not forget to bring your masquerade mask and your er ego trip because you're gonna need it when you go down to Max's Kansas City, baby. I tried to break away but I can't cut you loose. I try to keep dry but baby, you got me juiced. Can't you see the gleam in my eye? You make me cream in my jeans - ha ha. You make me cream in my jeans - oh yeah. When I look at you baby you really freak me out. You must be wearing everything in your house. You look like a crazy junkie from the house of wax. Like last year's Christmas tree - baby that's a fact. You've really flipped your wig babe. I can't believe you walk the streets like that. You're wearing everything but a lampshade. You really flipped your wig babe. I can't believe you walk the streets that way. Like Cherry Vanilla and Wayne County at The Trucks. Like a blind man trapped in a thrift shop ????. There's no reason in asking why you dress that way. Like Sable Starr on a bum trip from L.A. I can't believe you actually walk around the streets that way. Why you're wearing everything but a lampshade. Boy you've really flipped your wig this time baby. They're gonna kill all of the pigeons in New York City. And we're gonna take the little dead pigeons and put them in care packages. And send them to the starving people in India. Everything but a lampshade, lampshade. You've really flipped your wig babe, wig babe. I can't believe you walk the streets that way, streets that way. Over 99% of all of the people living in New York City are crazy baby.